New data on regional gross domestic product (GDP) was published by Eurostat yesterday. It is for the year of 2008 and covers the 27 Member States. When you look at the data for NUTS 2 level the results are very interesting. 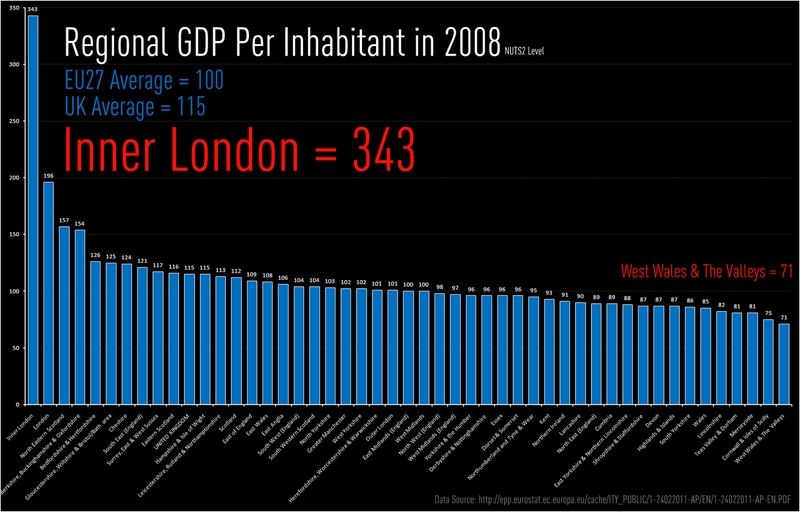 When you account for purchasing power standards and index the EU average at 100, the highest figure is Inner London, at 343. 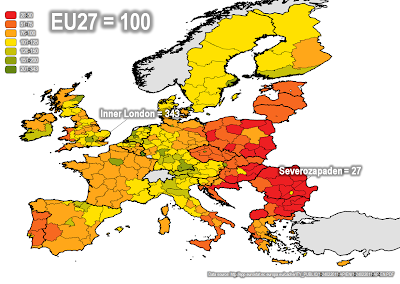 The lowest figure is for the Bulgarian region of Severozapaden - officially the poorest region in the EU by this measure. "Among the 64 regions below the 75% level, fifteen were in Poland, seven each in the Czech Republic and Romania, six each in Bulgaria and Hungary, four each in Italy and Portugal, three each in Greece, France (all overseas departments) and Slovakia, two in the United Kingdom, one in Spain, as well as Estonia, Latvia and Lithuania." As you'd expect, this new data has led to various news stories, including this one by the BBC. The data on GDP are never as up to date as we'd like, but it is interesting looking across the regions of the EU and particularly so when we map it. Over the past few years there has been a growing awareness of the ways in which technology can help cities work more effectively and efficiently. One major initiative in this vein is IBM's Smarter Cities project/programme, which is all about being 'smart' as cities grow and grow and consume more of the world's resources. 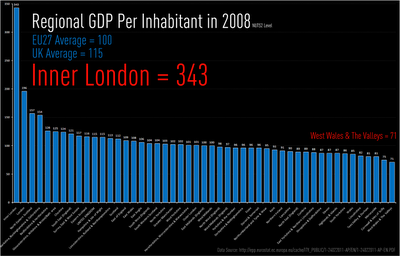 "In 1900, only 13% of the world's population lived in cities. By 2050, that number will have risen to 70%. We are adding the equivalent of seven New Yorks to the planet every year. This unprecedented urbanisation is both a sign of our economic and societal progress and a strain on the planet's infrastructure. It's a challenge felt by mayors, heads of economic development, our schools, police chiefs and other leaders who each help to build and support the communities in which we live. The challenges these leaders face — educating the young, keeping citizens safe and healthy, attracting and facilitating commerce, and enabling the smooth flow of planes, trains, cars and pedestrians — are compounded by the global economic downturn. Thankfully, help is at hand. 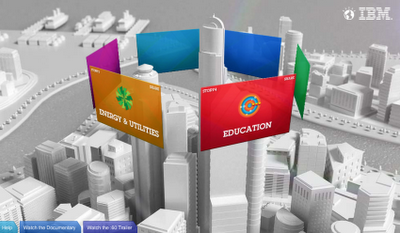 Around the world, intelligence is being infused into the way our cities work." I've just highlighted the UK section of the IBM Smarter Cities site here but it does refer to places across the globe and in the Case Study section you can see examples from Alameda, Queensland and Madrid, among other places. There's even a story about 'CovJam' - click the link to find out more and watch the video below! There is a special conference on this theme at MIT in April, called Forum on Future Cities, which is likely to be very interesting. Once upon a time, when you put the search term 'UHI' into google, you might have been left with a lot of results about urban heat islands. 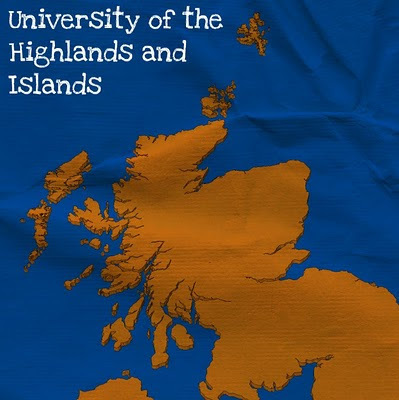 Now, searching for 'UHI' (from within the UK) will lead you towards the University of the Highlands and Islands website. It's been a long time coming but it only officially became a University in February 2011. Why do I care, and why am I writing about this? Because I'm from the Highlands, I studied the structure and location of UHI during my MA dissertation research and - most importantly - there has never been a University in this area before. The Highland local authority area is not quite the same as the area covered by UHI, but even on its own it is bigger than Belgium (coincidentally, where I'm going today) - so it meant that young people often had to leave if they wanted to go to University. Now they have a choice. The University is comprised of 13 different institutions, spread throughout the Highlands and Islands, from Shetland in the far north to Perth in the south. The range of courses is slightly different from other universities and it includes education in Gaelic too. I'm very happy about this development, though in the history of higher education in Scotland and the UK it could have arrived at a better time!